In 1902, the Kennel Club of England recognized the English Springer Spaniel as a distinct breed. In the 1800 the American Spaniel Club was founded, and in 1924, the English Springer Spaniel Field Trial Association was formed and the breed become more well known. The name "Springing Spaniel" included one classification the ancestral stock from which many of our present-day land spaniels emanated. In the 1800s, Springers and Cockers were often born within the same litter, size alone being the distinguishing factor. In 1902, the Kennel Club of England recognized the English Springer Spaniel as a distinct breed. In 1880, the American Spaniel Club was founded and theirs was the task of sorting out the breed by size, with anything over 28 pounds being classified as a Springer. Though several individuals in America had these spaniels for their shooting, it was not until 1924, when the English Springer Spaniel Field Trial Association was formed, that they became better known. Field trials were inaugurated, and three years later (1927) the English Springer Spaniel Field Trial Association became the parent club of the breed. This association has aimed to further the English Springer Spaniel both on the bench and in the field. 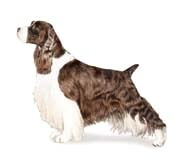 Its AKC standard, formed in 1927 and first revised in 1932, was made as nearly as possible to foster the natural ability of the Springer Spaniel, a hunting dog that, with training, could do the work required of him. The association has also conducted field trials every year, and it has endeavored to demonstrate to the public just how good the dogs are as shooting dogs. As competition becomes greater, they must of necessity be able to cover their ground rapidly, and if well trained, to obey signals or orders given them. Unquestionably the present standard has helped to make the Springer more uniform as a breed, and as a result the dogs as individuals have become much more uniform at bench shows and in field trials. They are admittedly great sporting dogs, hence should not be allowed to lose any of their standard characteristics; that is, they must not become heavy-boned and stocky in type and thus risk any loss of usefullness in the field. Their one purpose is to hunt and find game. General Appearance The English Springer Spaniel is a medium-sized sporting dog, with a compact body and a docked tail. His coat is moderately long, with feathering on his legs, ears, chest and brisket. His pendulous ears, soft gentle expression, sturdy build and friendly wagging tail proclaim him unmistakably a member of the ancient family of Spaniels. He is above all a well-proportioned dog, free from exaggeration, nicely balanced in every part. His carriage is proud and upstanding, body deep, legs strong and muscular, with enough length to carry him with ease. Taken as a whole, the English Springer Spaniel suggests power, endurance and agility. He looks the part of a dog that can go, and keep going, under difficult hunting conditions. At his best, he is endowed with style, symmetry, balance and enthusiasm, and is every inch a sporting dog of distinct spaniel character, combining beauty and utility. The head is impressive without being heavy. Its beauty lies in a combination of strength and refinement. It is important that its size and proportion be in balance with the rest of the dog. Viewed in profile, the head appears approximately the same length as the neck and blends with the body in substance. The stop, eyebrows and chiseling of the bony structure around the eye sockets contribute to the Springer's beautiful and characteristic expression, which is alert, kindly and trusting. The eyes, more than any other feature, are the essence of the Springer's appeal. Correct size, shape, placement and color influence expression and attractiveness. The eyes are of medium size and oval in shape, set rather well-apart and fairly deep in their sockets. The color of the iris harmonizes with the color of the coat, preferably dark hazel in the liver and white dogs and black or deep brown in the black and white dogs. Eyerims are fully pigmented and match the coat in color. Lids are tight with little or no haw showing. Eyes that are small, round or protruding, as well as eyes that are yellow or brassy in color, are highly undesirable. Ears are long and fairly wide, hanging close to the cheeks with no tendency to stand up or out. The ear leather is thin and approximately long enough to reach the tip of the nose. Correct ear set is on a level with the eye and not too far back on the skull. The skull is medium-length and fairly broad, flat on top and slightly rounded at the sides and back. The occiput bone is inconspicuous. As the skull rises from the foreface, it makes a stop, divided by a groove, or fluting, between the eyes. The groove disappears as it reaches the middle of the forehead. The amount of stop is moderate. It must not be a pronounced feature; rather it is a subtle rise where the muzzle joins the upper head. It is emphasized by the groove and by the position and shape of the eyebrows, which are well-developed. The muzzle is approximately the same length as the skull and one half the width of the skull. Viewed in profile, the toplines of the skull and muzzle lie in approximately parallel planes. The nasal bone is straight, with no inclination downward toward the tip of the nose, the latter giving an undesirable downfaced look. Neither is the nasal bone concave, resulting in a "dish-faced" profile; nor convex, giving the dog a Roman nose. The cheeks are flat, and the face is well-chiseled under the eyes. Jaws are of sufficient length to allow the dog to carry game easily: fairly square, lean and strong. The upper lips come down full and rather square to cover the line of the lower jaw, however, the lips are never pendulous or exaggerated. The nose is fully-pigmented, liver or black in color, depending on the color of the coat. The nostrils are well-opened and broad. Teeth are strong, clean, of good size and ideally meet in a close scissors bite. An even bite or one or two incisors slightly out of line are minor faults. Undershot, overshot and wry jaws are serious faults and are to be severely penalized. The Springer has an outer coat and an undercoat. On the body, the outer coat is of medium length, flat or wavy, and is easily distinguishable from the undercoat, which is short, soft and dense. The quantity of undercoat is affected by climate and season. When in combination, outer coat and undercoat serve to make the dog substantially waterproof, weatherproof and thornproof. On ears, chest, legs and belly the Springer is nicely furnished with a fringe of feathering of moderate length and heaviness. On the head, front of the forelegs, and below the hock joints on the front of the hind legs, the hair is short and fine. The coat has the clean, glossy, "live" appearance indicative of good health. It is legitimate to trim about the head, ears, neck and feet, to remove dead undercoat, and to thin and shorten excess feathering as required to enhance a smart, functional appearance. The tail may be trimmed, or well fringed with wavy feathering. Above all, the appearance should be natural. Overtrimming, especially the body coat, or any chopped, barbered or artificial effect is to be penalized in the show ring, as is excessive feathering that destroys the clean outline desirable in a sporting dog. Correct quality and condition of coat is to take precedence over quantity of coat. All the following combinations of colors and markings are equally acceptable:(1) Black or liver with white markings or predominantly white with black or liver markings; (2) Blue or liver roan; (3) Tricolor: black and white or liver and white with tan markings, usually found on eyebrows, cheeks, inside of ears and under the tail. Any white portion of the coat may be flecked with ticking. Off colors such as lemon, red or orange are not to place. The typical Springer is friendly, eager to please, quick to learn and willing to obey. Such traits are conducive to tractability, which is essential for appropriate handler control in the field. In the show ring, he should exhibit poise and attentiveness and permit himself to be examined by the judge without resentment or cringing. Aggression toward people and aggression toward other dogs is not in keeping with sporting dog character and purpose and is not acceptable. Excessive timidity, with due allowance for puppies and novice exhibits, is to be equally penalized. Summary In evaluating the English Springer Spaniel, the overall picture is a primary consideration. One should look for type, which includes general appearance and outline, and also for soundness, which includes movement and temperament. Inasmuch as the dog with a smooth easy gait must be reasonably sound and well-balanced, he is to be highly regarded, however, not to the extent of forgiving him for not looking like an English Springer Spaniel. An atypical dog, too short or long in leg length or foreign in head or expression, may move well, but he is not to be preferred over a good all-round specimen that has a minor fault in movement. It must be remembered that the English Springer Spaniel is first and foremost a sporting dog of the Spaniel family, and he must look, behave and move in character.